Accurate and precise identification lies at the heart of methods that use the composition of aquatic communities to infer aspects of water quality or ecological status. Biologists involved in the practical application of methods need identification guides that are geared to their purposes. 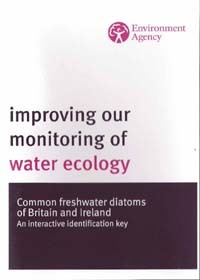 Bowburn Consultancy has been involved with two projects to develop user-friendly identification guides to freshwater diatoms. This key is based on an early effort to help National Rivers Authority staff learn enough about diatom identification to evaluate the Trophic Diatom Index (TDI). 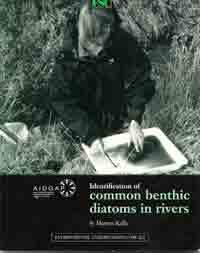 It includes all the genera of freshwater diatoms – centric and pennate – commonly found in UK freshwaters, plus more detailed keys to help name the most common species found in rivers. There are over 200 line drawings of species, plus detailed notes on morphology and ecology as well as guidelines on sampling and on the use of two simple pollution indices – the TDI and the Generic Diatom Index. An important feature of the key was the extensive pre-publication testing, both through the Algal Training Course held annually at the University of Durham, and through the Field Studies Council’s AIDGAP ("Aids to the Identification of Difficult Animals and Plants") procedure. This involved the distribution of over 250 copies to reviewers who ranged from secondary schools to professional taxonomists. Their comments were used to prepare the final version that was published in 2000 in the Field Studies Council’s journal Field Studies. Copies are available at £11.50 plus postage and packing either direct from Field Studies Council publications or direct from Bowburn Consultancy. A subsequent collaborative project with the Environment Agency and four other institutions developed an interactive CD-ROM for identifying river diatoms. 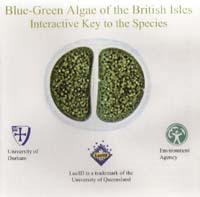 The project follows on from two earlier projects which developed interactive keys for the blue-green algae and green algae using the Lucid software developed by the University of Queensland, Australia and uses databases of images collected during two EU-funded projects, ADIAC and EDDI. The CD was available to buy from the Environment Agency website until 2014 when it was deleted from the catalogue. The sad story behind this is described in more detail in a blog post “The decline and fall of a CD-ROM”. However, all of the information on the CD-ROM, with the exception of the keys themselves, are accessible via Steve Juggin's personal website at Newcastle University. Kelly, M.G., Bennion, H., Cox, E.J., Goldsmith, B., Jamieson, B.J., Juggins, S., Mann, D.G. & Telford, R.J. (2005). An interactive CD-ROM for identifying freshwater diatoms. pp. 153-161. Proceedings of the 18th International Diatom Symposium (edited by A. Witkowski). Biopress, Bristol.